AMAZINGLY SOFT: Even with the protective coating, the outdoor pillow covers still feel nice and soft to make for incredibly cozy lounging out on the patio or indoors. BEAUTIFY ANY SPACE: With over 100 decorative designs to choose from, you can mix and match the accent pillow covers for gorgeous outdoor patio décor. 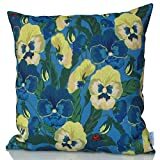 UV AND WATER RESISTANT: Carefully treated for outdoor use, these 18″ x 18″ and 24″ x 24″ pillow covers for throw pillows spruce up your space while remaining in great condition. MADE TO LAST: Experience a premium polyester fabric, a sturdy zipper, and painstaking stitching in every cover. These are the best quality pillow covers you can find – guaranteed. 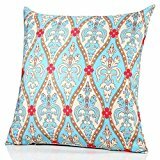 PREMIUM PEDIGREE: With over 20,000 satisfied customers and 99% 5-star reviews, these are hands down the best accent throw pillow covers in the market. relaxing on the sofa and drift into total bliss. completely change the look and feel of an entire room and turn a mundane space into a glorious affair. – Water resistant and UV treated for use in shaded patios and decks. – Nice and soft feel even with the layer of protective coating. – Hand-sewn for supreme quality and made using durable polyester. – Over 100 beautiful designs to suit any décor and taste. – Can be used both indoors and outdoors for a lovely splash of color. – IMPORTANT: ONLY COVER – NO PILLOW INCLUDED. Mix and match to add an unmistakable touch of style to your home. Click ‘Add to Cart’ now to experience the highest quality pillow covers around! 15 Year Guarantee! 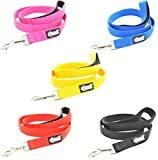 Only ever purchase one dog lead! Dexil (TM) bring to you an Elite range of collars, leads and harnesses after much success with our Award Winning Colour Coded Awareness Products. The main priority of our products are to give excellent quality and and assurance for you and your loyal friend, wether out on walks in public, or in your home environment. Using the best materials available and upgraded hardware, you can put your trust into our brand. Our dog leads offer luxury padded handles, extra strong trigger hooks and extremely strong. Coming with a 15 year guarantee for the life of your furry friend, we are the only brand who can offer this to our customers. Have a look at our other products, you may be suprised! Happy wags and walks!